Being the eldest child, Hya Tara Leonardo learned to be responsible at a young age. 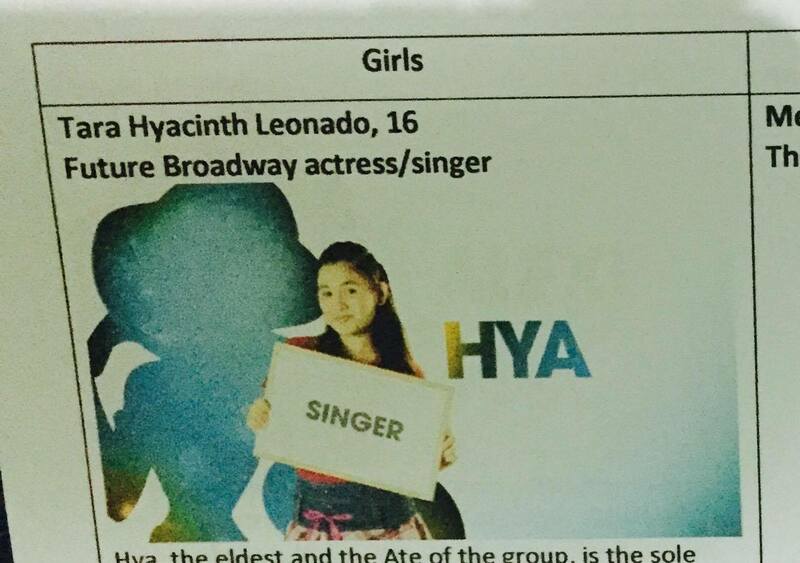 She dreams of being in the theatre industry since her love for singing was very much evident since she was young. Hya began helping earn for her siblings when her father passed away and her mother left them in the care of their grandmother. She is now the sole breadwinner of in the family and to make ends meet, she used her voice to earn money- singing in nightclubs, weddings and private parties. Her biggest break came when she won the Tawag ng Tanghalan Kids Competition on February 24, 2016. Since then, she has appeared in some minor theatre productions. With her passion for singing and determination to succeed, she aims to one day perform on Broadway like her Idol, Lea Salonga. On March 22, 2017, Hya Tara Leonardo will give her best in achieving her Broadway dream in Disney Princess: I Dare to Dream. Read more about--- I Dare To Dream. Want to watch the finale of Disney Princess: I Dare To Dream Concert on March 22 at the SM MOA Arena? You can get a 50% discount on tickets simply by using the promo code: Pbnet143 via sm/tickets. You can get a discount for a maximum of 6 tickets for a single transaction. Promo code is valid starting today until March 22, 2017 online or over-the-counter purchase. This is made possible between Globe Telecom and the Philippine Bloggers Network (PBNet). 1. Who is your favorite Disney Princess? 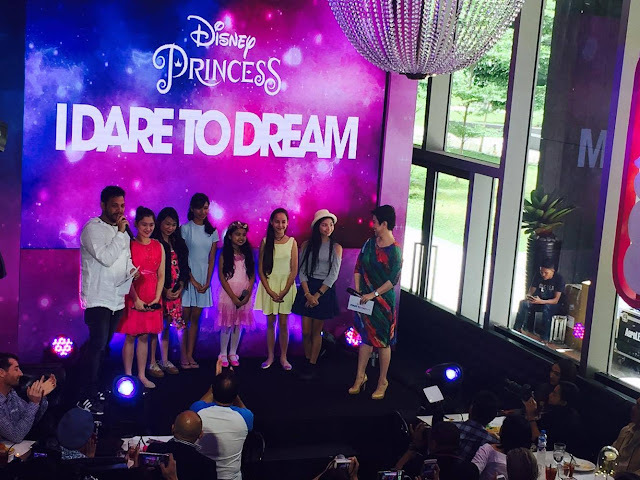 2. Who do you think will emerge as the winner of Disney Princess: I Dare To Dream? 3. Your name and email address. I will be raffling off 5 pairs of tickets for the concert. Deadline is on March 21 (12nn Manila time). I would love to watch this event with my husband and daughter on March 22 as this is also my 28th birthday. Growing up I am a fan of Snow White. I admire her complexion, red lips and jet black hair. But there's more than what the eyes can see. She is innocent, kind, gentle and sweet. Her generosity and trusting caused her trouble as many takes advantage from it like her stepmother. Aside from that she is motherly, compassionate and takes delight on taking care of the household when she lived with the dwarfs. With her kindness, ethereal beauty, resilience and inner strength against adversity, she can charm everyone except her stepmother. I am torn between Hya and Liana. I see Hya's compassion and selfless love for her family that serves as her motivation to success. For Liana, I see her flexibility and courage as an inspiration to the young ones to soar above adversity and challenges. I am excited to know who will win. My favorite Disney Princess is Ariel, The Little Mermaid. She is brave, beautiful, and never backs down. Ariel is flawless. Her song "Part of Your World" never gets old. My favorite Disney Princess is Mulan. She's one tough cookie and will do everything in her power to make sure peace will reign in their town. Hya Tara Leonardo is my bet. She has the bravura and the potential with her very own singing style. Hi, I am Beatriz Mendoza, 10 years old from Paranaque City. I hope to watch Disney’s I Dare to Dream because I love everything about Disney; their songs, movies and all Disney characters. It is my world! I am a Disney fan forever. My favorite Disney Princess is Fa Mulan because she inspires me to become brave, to stand up for what I want and I what believe with not being disobedient to my parents, to protect my family and friends, and to never give up during difficult situations. For me, she is the only Disney Princess who always manages herself without magic; she likes to eat, sometimes she is clumsy and silly but she eventually handles it really well because she is not afraid to take chances. I want to be like her, I want to help myself to change and become a better and truer version of myself. I think everyone deserves to win, to be called a Disney Princess. I like Hya Leonardo to win because she inspires everyone to dream big and work hard to help her family and do what she really love. I also like Liana San Diego to win because someday I also want to become a veterinarian because I want to help animals and teach other people to learn to love animals just like a family member or a friend. I admire her for being so determined to learn and finished all the challenges during their stay at Disney Princess house. I'd like Stephanie to win. Like Rapunzel, I can see kindness, joy, purity and innocence in her spirit. I love her spontaneity while doing every challenges. I can see that she's really being true to herself and to the people around her. For me, this kid deserves to become a real life Disney Princess. My favorite Disney Princess is Merida. Merida from "Brave" is not your typical Disney Princess. She is very independent and courageous and she knows herself well. I admire her for refusing to conform to anyone else that doesn't suit her.She is contented to be single. She doesnt need a Prince to make her happy. She is so brave. She did not rely on anyone else to fix her mistakes. She showed how mother-daughter relationship can be mended through patience, courage and love. I never thought I could love a Disney Princess more than her. Hya Leonado deserves to win. She is an inspiration because she is selfless, she puts her family first before herself. She really has the potential to be a theater actor because of her unique talent and determination.